In February, audiences will be treated to a dramatic retelling of the exploits of the Army’s Monuments, Fine Arts and Archives unit. The team, made up of art historian-types, was tasked with tracking down treasures looted by the Nazis in World War II. The release of “Monuments Men” (written by George Clooney, directed by George Clooney, starring George Clooney, including George Clooney as best boy) comes shortly after the government seized the personal journals of one of the architects of the Nazis’ plunder program. We recently wrote about the fate of the Alfred Rosenburg’s diaries, which apparently had been snagged (or retained for personal purposes “in contrary to law and proper procedure,” as customs officials put it) by a prosecutor at the Nuremberg Tribunals, which put Rosenburg to death by hanging in 1946. The diaries had been missing until 2012 when someone started shopping them around for possible auction. The government stepped in to seize the records and give them to the U.S. Holocaust Memorial Museum. — The government continues to keep secret the identity of the person who possessed the journals, redacting his/her name and place of employment. — Rosenberg’s records were found hidden behind a false wall in a Bavarian castle in 1945. — Investigators used scholarly references to Rosenburg’s diaries to determine that the Nuremberg prosecutor held on to the records and occassionally shared them with other researchers. — There is a curious redaction on page 4. Any idea what they are trying to cover up here? 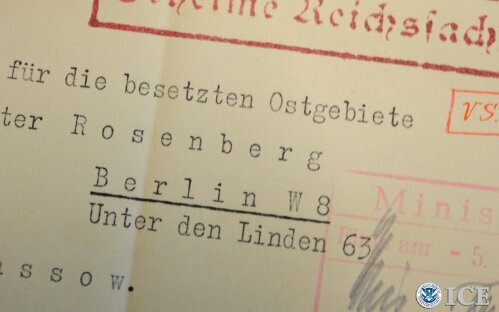 Over the summer, we told you about Alfred Rosenberg, one of the leaders of the Nazi’s initiative to loot cultural property following World War II invasions whose own journals later became the subject of a cultural property investigation ( Diary of a madman; Rosenberg diary warrant ). WASHINGTON —U.S. Immigration and Customs Enforcement transferred the lost diary kept by Alfred Rosenberg, a close confidant of Adolf Hitler, to the U.S. Holocaust Memorial Museum in Washington. This historical document was seized by ICE Homeland Security Investigations special agents in Wilmington, Del., following an extensive investigation. The “Rosenberg Diary” was written by Alfred Rosenberg, a leading member of the Third Reich and of the Nazi Party during World War II. Rosenberg was privy to much of the planning for the Nazi racial state, mass murder of the Jewish people and other ethnic groups, planning and conduct of World War II and the occupation of Soviet territory. A living memorial to the Holocaust, the U.S. Holocaust Memorial Museum inspires citizens and leaders worldwide to confront hatred, prevent genocide, and promote human dignity. The Myth of the Twentieth Century, a book written by Rosenberg, articulated the philosophical underpinnings of national socialist ideology. Rosenberg served as head of the Nazi party’s foreign affairs department and as the Reich Minister for the Occupied Eastern Territories, which included the Baltic States, Ukraine and parts of Belorussia. As Reich Minister, Rosenberg played a significant role in the mass murder of the Jewish people in the Occupied Eastern Territories, as well as the deportation of civilians to forced labor camps to support the German war effort. Rosenberg also established and headed an organization, Einsatzstab Reichsleiter Rosenberg (Reichsleiter Rosenberg Taskforce), the mission of which was to loot cultural property from all over Europe. We have been looking to find more information on the recently recovered Rosenberg diary. 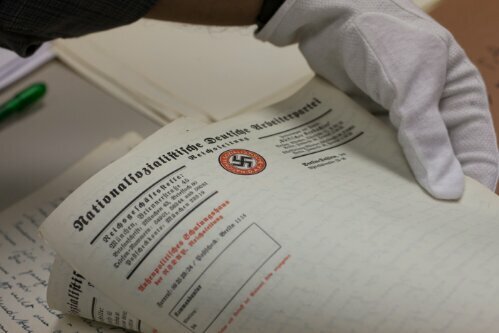 Last week, we wrote about the seizure of the journals of Nazi leader Alfred Rosenberg in Delaware. The writings have been missing since shortly after Rosenberg’s war crimes trial following World War II. They were allegedly taken by a former Nuremberg and then surfaced earlier this year. What happened after the disappearance and before the discovery is vague, as are the circumstanced behind their recovery. We were able to find is posted below — the warrant signed a federal judge authorizing the seizure, and the return filed by a federal agent after the papers were seized. Court records indicate the case was initiated in April 2013, and the warrant was OKed on April 18. It was executed that same day. On June 11, the warrant and return were unsealed, and they remain the only records open to public inspection. Records show two other documents were filed with the court before the warrant, and those remain sealed. The warrant and return don’t have much to add. But there are photocopies of several hand- and typewritten pages in German that are apparently parts of the diary. Think of it as the antithesis to the diary of Anne Frank. A top Nazi, Alfred Rosenberg, the guy who coined the concept of Lebensraum and helped orchestrate the deaths of countless innocent lives, kept a journal. After Rosenburg was hanged for war crimes, one of the prosecutors at the Nuremberg trials raided the Allies’ evidence locker and snagged Al’s writings. The prosecutor died a short time later, and now the Nazi diary has been seized by the U.S. government, according to an announcement by Immigration and Customs Enforcement officials. The ICE account of what happened (posted below) glosses over much of the middle part of the diary saga. Media accounts talk of a legal battle between parties that had some claim to the journal. WILMINGTON, Del. — Federal officials and representatives from the U.S. Holocaust Memorial Museum in Washington announced the seizure of a long-lost diary kept by a close confidant of Adolph Hitler. The recovery of this historical document was the result of an extensive investigation conducted by U.S. Immigration and Customs Enforcement’s (ICE) Homeland Security Investigations. The “Rosenberg Diary” was written by Alfred Rosenberg, one of the most notorious members of the Third Reich and of the Nazi Party during World War II. Rosenberg was privy to much of the planning for the Nazi racial state, mass murder of the Jewish people, planning and conduct of World War II and the occupation of Soviet territory. As such, his diary entries could provide historians with a potential wealth of previously unknown information regarding the history of this period. The Myth of the Twentieth Century, written by Rosenberg, articulated the philosophical underpinnings of national socialist ideology. Rosenberg served as head of the Nazi party’s foreign affairs department and as the Reich Minister for the Occupied Eastern Territories, which included the Baltic States, Ukraine and parts of Belorussia. As Reich Minister, Rosenberg played a significant role in the mass murder of the Jewish people in the Occupied Eastern Territories, as well as the deportation of civilians to forced labor camps to support the German war effort. Rosenberg also established and headed an organization, Einsatzstab Reichsleiter Rosenberg (Reichsleiter Rosenberg Taskforce), the mission of which was to loot cultural property from all over Europe. Dr. Robert M.W. Kempner was a German lawyer who fled Germany for the United States during the war. At the conclusion of the war, Kempner served as the deputy chief counsel and was the chief prosecutor in the “Ministries Case” at the Nuremberg Trials. In this role, Kempner had access to seized Nazi documents in his official capacity as an employee of the U.S. government. At the conclusion of the Nuremberg Trials, Kempner returned to the United States and lived in Lansdowne, Pa. Contrary to law and proper procedure, Kempner removed various documents, including the Rosenberg Diary, from U.S. government facilities in Nuremberg and retained them until his death in 1993. In November 2012, the U.S. Attorney’s Office for the District of Delaware and HSI special agents received information from an art security specialist, who was working with the U.S. Holocaust Memorial Museum, regarding the search for Rosenberg Diary. The Rosenberg Diary was subsequently located and seized pursuant to a warrant issued by the U.S. District Court for the District of Delaware.